Cornerback is a sneaky underrated need for the Eagles, both in the short term and long term. The Eagles' cornerback position has promise, yet there is certainly room for upgrades and depth. The Eagles had little choice but to overspend on a corner in free agency last offseason, and Byron Maxwell predictably did not live up to his pay scale. Maxwell got torn apart early in the season, but when the Eagles scaled back what they asked of him within their defensive scheme, he played much better. On the other side, Nolan Carroll was solid before being lost for the season. He's a free agent, and unlikely to return. When Carroll went down, Eric Rowe stepped in and showed he can be a good starting corner after some early struggles. In their nickel packages, the Eagles would often drop safeties Malcolm Jenkins and Walter Thurmond down into the slot, and then put an additional safety in the game. My bet would be that Jim Schwartz would prefer to have a dedicated slot corner. Last season JaCorey Shepard looked good in training camp but was lost for the season with a torn ACL. To be determined if he'll be back to full strength, and if the new regime likes him as much as the old one did. In the short term, the Eagles were running guys like Ed Reynolds and Chris Maragos onto the field in nickel looks. That's not good. An additional corner, preferably once with inside/outside versatility, would give the Eagles more numbers on the back end. In the long term, the Eagles are going to want to get out of Maxwell's contract whenever it's financially realistic. Ideally, they can have someone in place to take over on the outside whenever that's possible. Over his three-year career at Florida, Hargreaves had 10 interceptions and 38 pass breakups. After Florida State's Jalen Ramsey, Hargreaves may be the best CB prospect in the country. He is an outstanding cover corner, and very willing in run support. 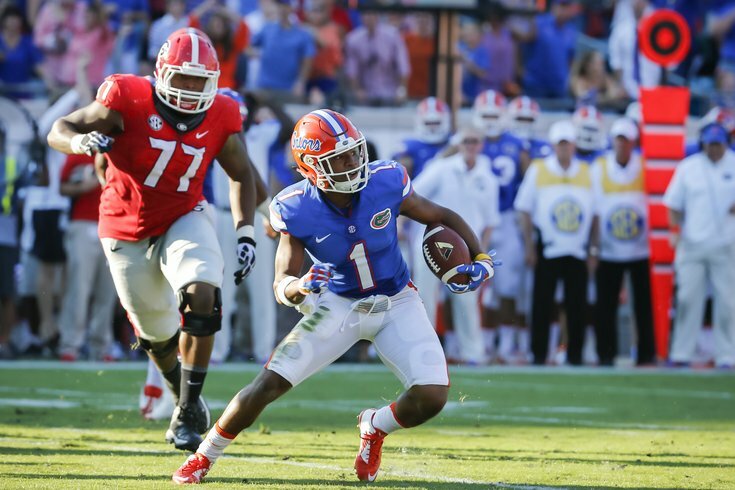 If there's a knock on him, Hargreaves doesn't have the size that many teams would prefer. Hargreaves wouldn't be a perfect positional fit for the Eagles at pick No. 13, but if he's still available, there's a chance he could be the highest rated player left on their board. Jackson has outstanding ball skills. He had 10 pass breakups in 2014 (a nice total), and 23 in 2015, which led the country. Jackson is a PBU machine, and he also had five interceptions this season, two of which he returned for pick-sixes. At 6'0, he has good size, but there is knock on him for not being very physical in the run game. At LSU, Mills played at safety, on the outside and in the slot. He has the versatility that teams now covet. Early in his career, he'll likely be a slot corner, with the potential to develop into more. If the Eagles' new regime is not as high on JaCorey Shepard as the last one was, a slot corner with upside could be of interest. Mills also has a serious incident on his record (via Emily Lane of Nola.com) that the Eagles will have to investigate. Mills was arrested in June after a woman who claims he punched her outside his Highland Road apartment picked him out of a lineup. He pleaded not guilty to the charge October. The alleged victim, who is 5-foot-3 inches tall and weighed 113 pounds, told police she was briefly knocked unconscious and received four stitches to her lip for her injuries, according to an affidavit of probable cause. Mills' attorney Brent Stockstill, however, had denied the alleged vcitim's account, saying it was actually Mills' girlfriend who threw the punch and that the victim gave multiple conflicting accounts of what happened. Russell showed off some of his athleticism this offseason with this incredible vault atop six boxes. The 5-11, 196-pound senior also has proven to be a standout DB for Notre Dame. He should put on quite a show after his college career when he gets to the NFL combine. In South Bend, he’s already broad-jumped 11-2 1/2 to go with his 40-inch vert. He’s also extremely strong for his size, squatting 500 pounds, benching 350 and doing 20 reps of 225 -- only two corners did more at the Combine in the past two years. Russell does have red flags that will push him down draft boards. He missed the 2014 season because of an academic fraud investigation. After returning for the 2015 season, Russell broke his tibia and was done for the season. If he's ready to compete on the field at the Combine, expect an eye-popping performance. The Eagles already spent significant resources on bigger corners, and it appears that they may have a good young player in Rowe. Since Jim Schwartz has already gone out of his way to note that he will scheme to his players' strengths, it would stand to reason that he will try to let his corners often be physical in press coverage at the line of scrimmage. If we're making the leap that Schwartz does indeed build his scheme to fit the big corners the Eagles already have in place, it would then make sense that the Eagles continue to target bigger corners. Is that oversimplified thinking? At 6'1, 209, Bradberry would be another bigger, physical corner to add to the mix.